*The bat that is displayed is a sample. The actual bat will have the names of the ASG MVP, winning pitcher, and the player with the game winning RBI. This year the AL and NL will square off against each other in our Nation's Capital for the playing of Major League Baseball's 89th Annual All Star Game. To celebrate this year's game we are pleased to present this officially licensed, full size bat featuring the reproduced work of noted artist Jolene Jessie. This special 89th Annual All Star Game Commemorative Art Bat is not available anywhere else and is a limited edition release. Each season the "Mid-Summer Classic" features many of the game's greatest players, and usually a future Hall of Fame member or two. This year should be no different. 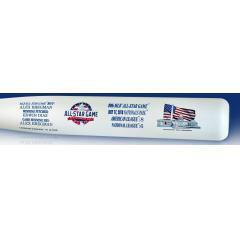 Order your commemorative bat today before they are gone! Due to the limited nature of this offer we must charge your credit card for the full price immediately upon taking your order. This policy ensures we reserve a bat for you. We will confirm your order by email. This bat is not game used. Please allow 4 to 6 weeks for delivery.